The objective of the Book, authored by Souvik Bhadra and Pingal Khan and published by Rupa Publications, appeals to those who are fond of trivia. 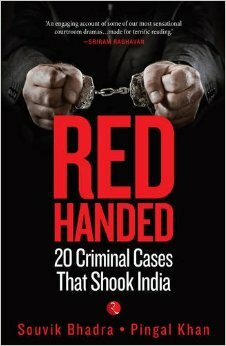 Each of the 20 Criminal Cases outlined can be a Book by itself. It must be said that the Authors have done well to avoid the temptation of being verbose. On the downside, the Book mostly reads like a College Project and lacks the forceful, biting insight that I was hoping to find. At pg. 9: Dhananjoy Chatterjee had Misti Doi for dinner on 13th August, 2004. At pg. 55: During the course of the Nitish Katara Murder Trial, Bharti Yadav was working as a staff nurse at a local hospital in United Kingdom. At pg. 64: Scottish Criminal Courts can return the verdict of “not proven” for lack of evidence. At pg. 96: Auto Shankar had a younger brother, Auto Mohan. At pg. 104: Zaheera Shaikh said once that Teesta Setalvad coerced her. At pg. 144: Sonia Gandhi was Sonia Maino before. At pg. 171: Charles Sobhraj masterminded a robbery at a jewellery shop in Hotel Ashoka, New Delhi once. At pg. 192: Sanjay Dutt received his first Filmfare Nomination for Best Actor for his performance in Sajaan. At pg. 211: A lawyer may refuse a brief only on grounds of inadequacy of fees or lack of expertise.